Hannah arrived at the centre having been purchased as a competition horse that had been schooled for show jumping. However, she would lean on the bit and pull whilst being ridden and exhibited problems with riding her that her owner was unable to resolve. As a result, Hannah was turned out and given very little work. Her owner felt that the Herdword programme would help her resolve the issues she was experiencing and finally brought her to the centre to see what could be achieved. 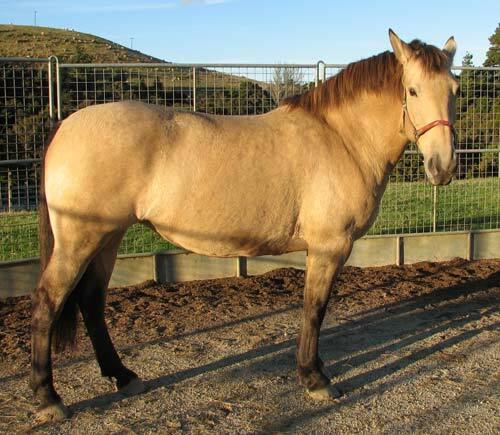 Prior to Hannah's arrival, I had visited the horse in her home just south of Auckland. The mare was extremely sluggish, bad tempered and depressed. 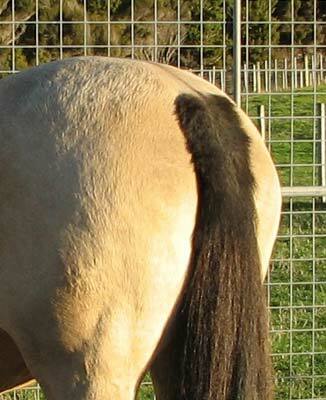 The mare continually gave aggressive gestures with ears flat back, refusing any encouragement for compliance. There is always a reason. Often there are many. At that time I recommended some Smart Bowen treatments in an attempt to 'free up' Hannah's system along with some basic exercises to develop improved movement and muscle tone. As the horse was grazed some distance from the owner's home, any consistency with the recommended exercises was virtually impossible. There were many reasons as on Hannah's arrival at the centre, a number of symptoms were identified. It took some time to obtain a urine sample so that this could be tested for any serious deposits or possible infection. Whilst the tests proved negative, experience has shown that inflammation is often present in such cases and causes varying levels of irritating discomfort. The horse was given homeopathic and herbal remedies for the kidneys along with Flax Seed Oil for her condition. Once a week she was given Magnesium Sulphate in a small feed of chaff and given Silica Tissue Salts to help with her coat and the condition of the soles of her feet. As an interim, to keep her more comfortable, the soles of her feet were also treated with Keratex Hoof Hardener for a period of three months. Hannah was introduced to sodium in a feed of daily chaff to help encourage a more normal input of water. Fresh parsley was also given daily for overall cleansing purposes. Hannah's general health normalised and so she was slowly introduced to groundwork exercises. It was only when she was certain that she could rely on absolute consistency, communication that was totally clear and the correct application of appropriate reinforcers that she could depend on, that her attitude began to change. Hannah tried hard but still struggled physically. She was very wooden and stiff on the right rein and this was emphasised when her activities progressed to ridden work. At this stage it became obvious why she had leaned and pulled. Hannah had no idea of what to do with her head. It was like a giant bobble hanging off the end of an extended broom pole. 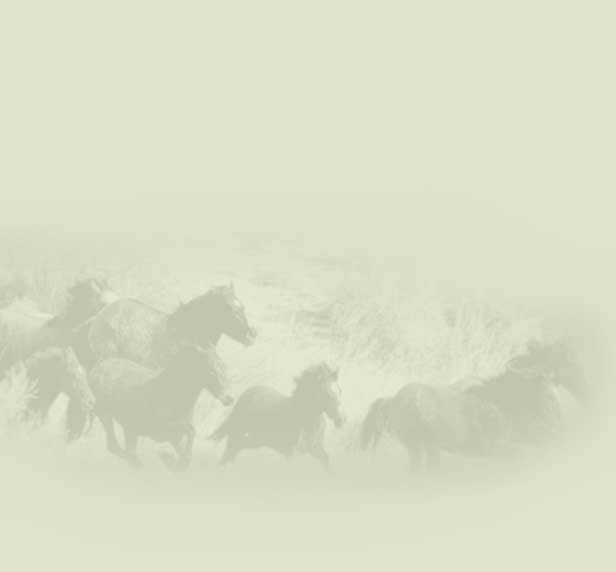 There was no doubt that draw-reins and the heavy hands employed during her transition from an unbroken youngster to a competitive horse had interfered with her self-carriage when under saddle. 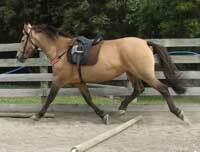 Work began on conditioning her response to the bit and teaching her to soften to lightest cue. Hannah just had to learn to carry that great head for herself in order to become light in the hand. 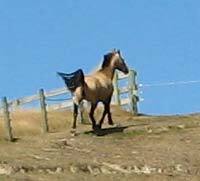 Although Hannah was Gisborne bred, as things unfolded with her rehabilitation there was a question mark over whether or not she had ever had the freedom to roam on the hills. So this was put to the test. Hannah was turned out with a companion on a paddock that has a steep bank. The water trough is in low flat part of the paddock. In order to see any additional horses Hannah had to make her way to the top of the bank. As horses like to spend a great deal of time on the high spots, Hannah would have to make regular trips up and down the bank to fulfil all of her physical and psychological needs. Hannah spent the winter of 2007 in this paddock. 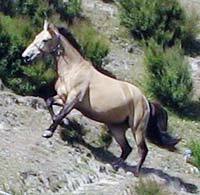 She would canter down the steep bank to greet us as we entered the paddock and canter back after being dismissed. Her sure-footed approach indicated that changes were taking place and at the start of 2008 Hannah was shod to resume a return to work programme. Hannah remembered everything she had been taught and with much enthusiasm approached her groundwork with energy and a level of agility that could not previously have been imagined. It is easy to see from the before and after pictures the extent of the change in the athletic ability that Hannah displays. As Hannah will be resuming ridden work within the next few weeks ….. watch this space for updates. Following Hannah's treatments she went through a number of weeks of groundwork exercises before being saddled. Although she is in her winter coat, it is still clear from the pictures that her muscle tone was still very inadequate and this was borne out by her short choppy stride. By comparison with the pictures taken in in the winter of 2006, in the spring of 2007 Hannah's return to work showed a marked improvement even within the first groundwork sessions. 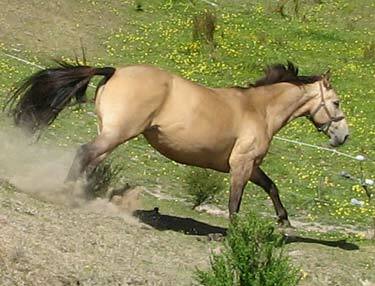 Note the dfference in the muscle tone of both the neck and the hind quarter enabling her to engage, collect and extend. On the hill Hannah can survey the farm and communicate with other horses that she cannot see from the grazing areas below. As can be seen from her paddock, this is a rough paddock with limited amounts of pasture in the lower areas. This paddock has suited her well. This paddock ensures the type of movement and food intake that Hannah needs to maintain an appropriate level of weight and remain agile. Hannah now regularly flaunts herself in a very sure-footed manner. This is her now typical manner of ascent and descent (top of page).